I last reviewed Makulu Linux back in May 2014 when it was still at version 6. I summed up my feelings towards Makulu Linux by stating that I can’t wait for versions 7, 8 and 9 and that I had the warm glow with Makulu which I had felt previously with SolusOS, Fuduntu and Point Linux. The artwork in Makulu Linux has always been very good and it has been put together in a unique and interesting way with some eclectic software picks. 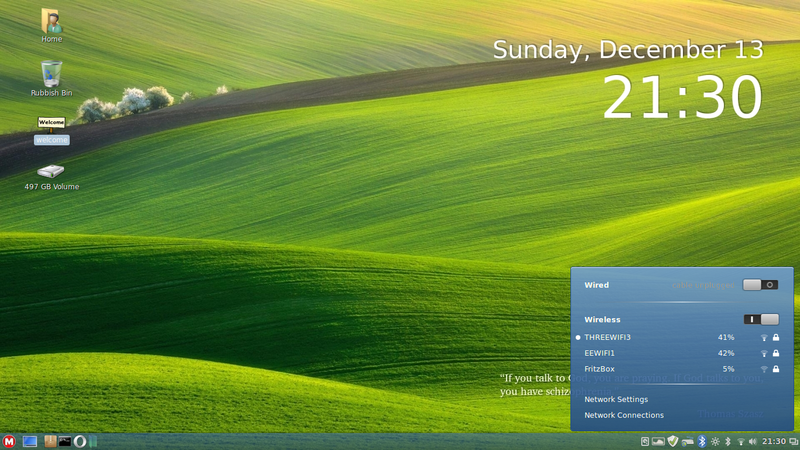 This is not a Windows Clone, it merely has a similar feel and look to it. It is 100% Linux and equally as powerful as any other Linux environment. This build only exists because users requested its existence. I watched a video review of Makulu Aero Edition by the Linux Help Guy. I like watching the videos that this guy produces and they are generally very positive in nature. With regards to Makulu however he asks the question “Who is this for?”. The point he makes is that if people want a Windows look why wouldn’t they just use Windows. You can download Makulu Linux from http://makululinux.com/downloads/ I used Rufus to create the bootable USB drive. Win32 Disk Imager let me down on this occasion. You can download Rufus from https://rufus.akeo.ie/. Alternatively you can buy a Makulu USB drive from here. After booting into the live version of Makulu click on the icon on the desktop to start the installation. A message will appear telling you that the password is makulu. Click “Yes” to start the installer. It might be worth connecting to the internet before starting the installation as it allows updates to be installed. I chose to install without connecting and a message pops up warning me that no updates will be installed. The next step is to choose the installation language. Another message pops up telling me that no additional languages can be downloaded because I am still not connected to the internet. (A bit overkill if you ask me). A big map will appear. 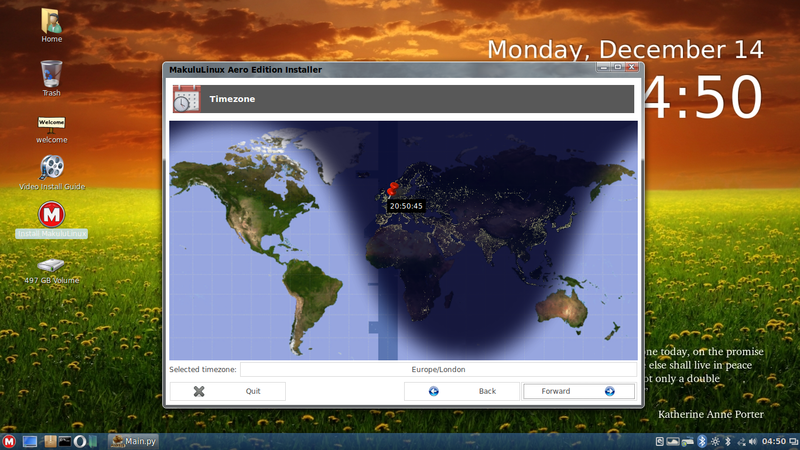 Click on where you live as this will set your timezone correctly when you boot into the full system. I wasn’t really typing this at 4.50 a.m. The live version appears to have a South African time zone. 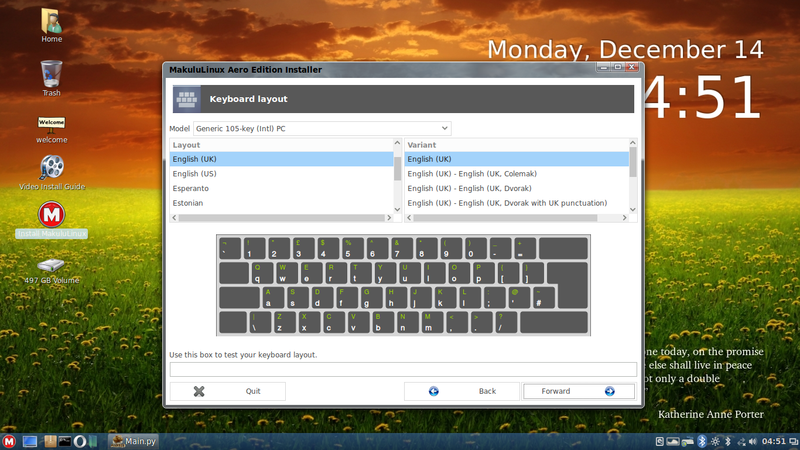 The next screen ask you to select your keyboard language and layout. You are now asked to create a default user. Simply enter a username, password and set the hostname for the computer. The final couple of steps revolve around the bit most new users dread and that is the partitioning. Makulu doesn’t make this bit especially easy. In my case I was going for a slightly trickier triple boot with Windows 10, Ubuntu and Makulu. As you can see from the image above my computer has an EFI partition, a large Windows partition and a large Ubuntu partition. There is no space for Makulu. To rectify this I clicked on the edit partitions button. At this point gParted loads and from there I chose the Ubuntu partition and right clicked and shrunk the partition. This creates a section of unllocated space. I formatted the unallocated partition to ext4 and from the main partitioning window I right clicked and marked the partition as the root partition. The last screen asks where to install GRUB. I chose to install to /dev/sda1 which is my EFI partition. This ultimately failed but I used the grub installer from Ubuntu to fix GRUB. I now have a triple boot system. Of course it would be easier for most people to install Makulu either as a virtual machine or as the only distribution on a computer. To really help you along. there is a video showing how to install Makulu on the desktop of the live version. Makulu Aero Edition is designed to look like Windows, so let’s deal with that point straight away. Yes it looks a bit like Windows and a lot of effort has gone into making it look like Windows but I don’t think it looks so much like Windows that it will confuse new users. It really doesn’t look that much different to Linux Mint. There are other Linux distributions out there that have a much closer look and feel to Windows. 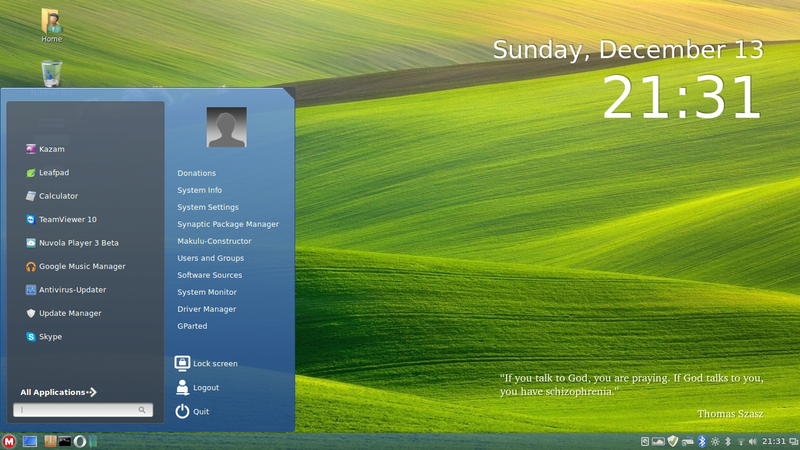 For a Windows 7 look try Zorin OS and for Windows XP there is the excellent Q4OS. (Check out this review of Q4OS and this guide to making Q4OS Linux look like XP). 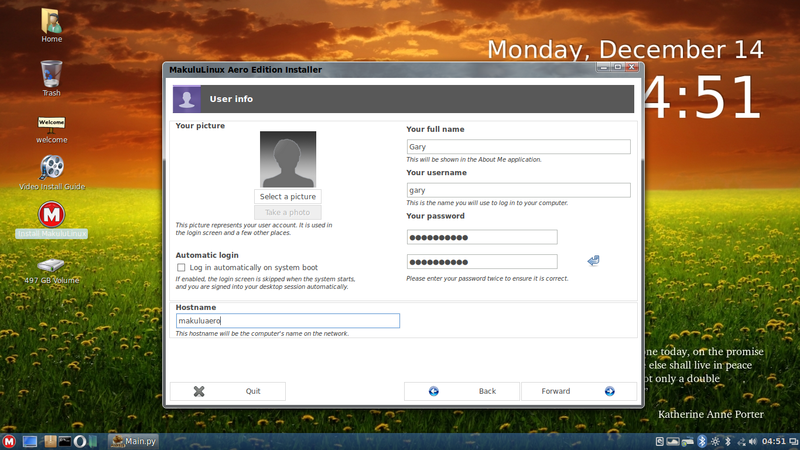 Makulu Linux Aero Edition comes with the Cinnamon desktop which by its very nature provides a very familiar Windows like look and feel with a panel at the bottom, a menu, quick launch icons and system tray icons. 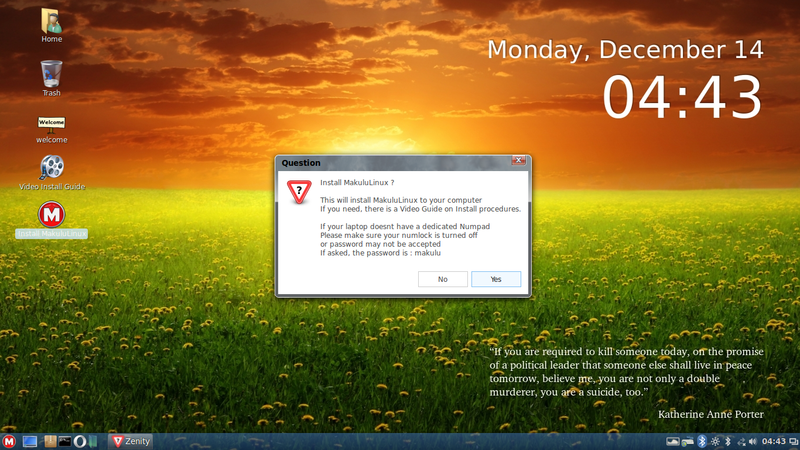 This is not a Windows clone, it merely has a similar look and feel to it. It is 100% Linux and equally as powerful as any other Linux environment. This build only exists because users requested its existences. This is a sensitive build, PLEASE use update manager to manage updates. 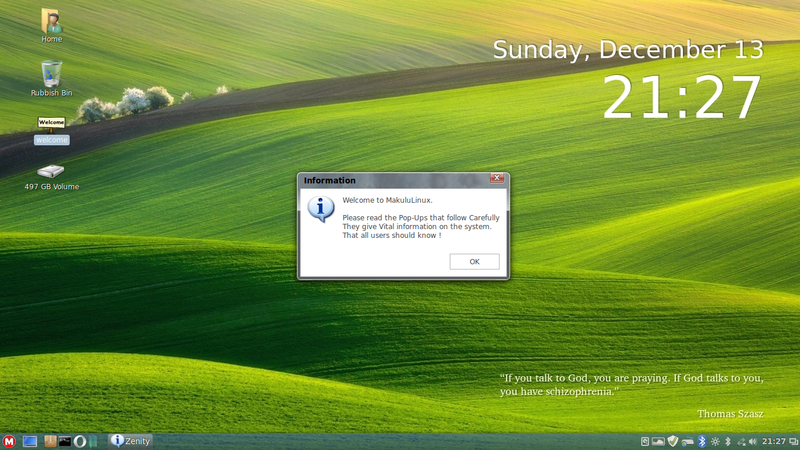 Do not update via custom scripts, commands or Synaptic manager. You have been warned. Use the Update manager to ensure smooth updating. The Linux Help Guy video makes a lot about the above message. The point he makes is that new users to Linux already confused by the Windows look might find that the distribution is already not straight forward because you have to be careful about how you update the system. To be honest whilst I see the point I don’t think it is a real issue. As I stated before, yes it looks a bit like Windows, Mint looks a bit like Windows but they don’t look so much like Windows that anybody is really going to be that confused and new users might not even know they can update using scripts or Synaptic so asking people to update using a tool called Update manager doesn’t sound like a bad thing. The next welcome screen states that the wallpaper is set using a tool called variety (which I will come to later on). Basically there is no point changing the wallpaper using Cinnamon’s desktop settings because Variety will change it. You have to turn off Variety if you want to us the default settings. On the 4th welcome screen (there are 10 in total) you are informed that you can change the update server if the one you are currently using is slow. You also need to reboot if you change language settings and furthermore you are told that there are a lot of new themes available within Makulu Linux. The 5th screen tells you that Popcorn time is installed by default and that in some countries it is not legal to use it (I will come to this later on). You are also informed that Google Cloud is available. Welcome screen 6 says that Pipelight is installed to enable Silverlight videos to be played, screen 7 states that Kingsoft Office is installed, Claws mail is installed, Steam and PlayOnLinux are installed and there is support for all documents and music formats. Almost there. Welcome screen 8 says that there are some WIFI tools installed for testing WIFI security. In addition Megasync is installed for synchronising with the Mega cloud storage service. There is also a firewall and antivirus software. Finally, screen 9 asks you to donate if you like the operating system and screen 10 wishes you well on your journey. On to the rest of the look and feel then. In the top right corner is a large clock, in the bottom right a quote of the day message and as you can see from the screenshot above when you press the little M in the bottom left corner a menu appears. 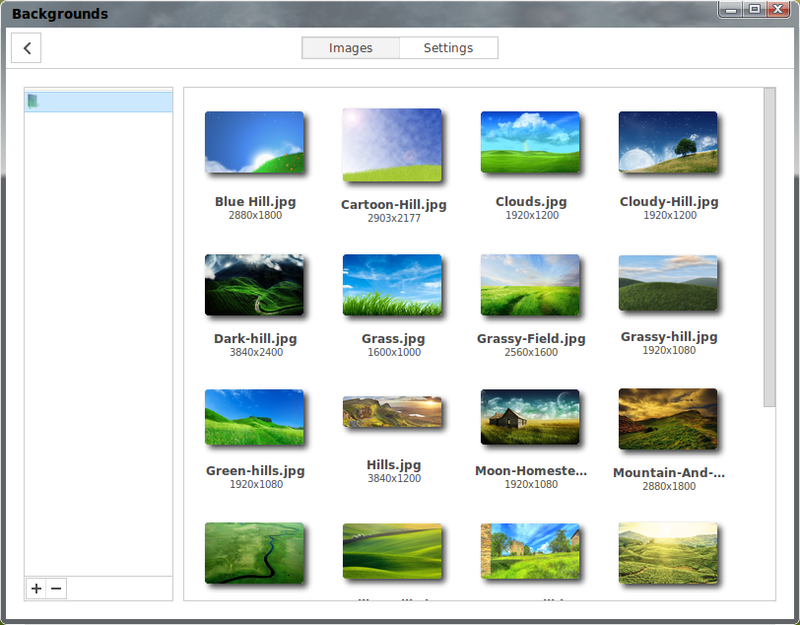 There is a tool called Variety which is used to customise your desktop’s look and feel. If you want to use Cinnamon’s desktop settings uncheck the box which reads “start variety when the computer starts”. 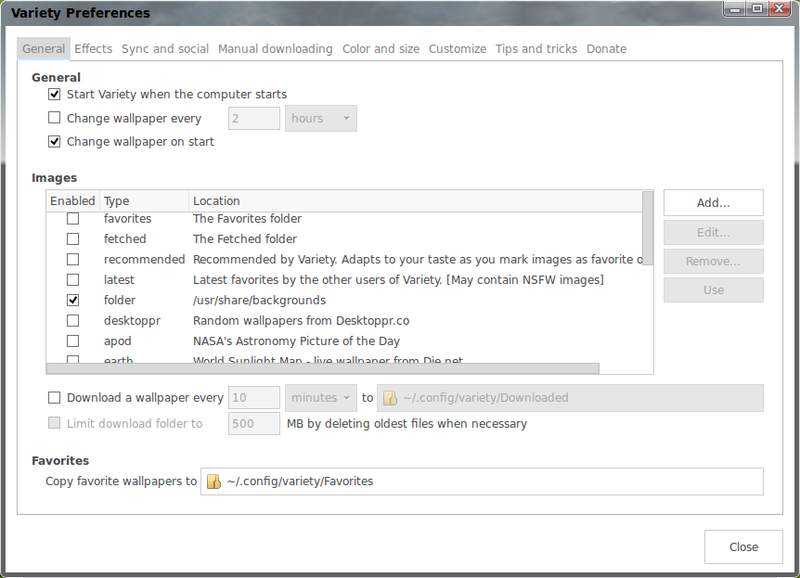 and also uncheck the “change wallpaper at start” checkbox. If you quite like the wallpaper changing then you can choose how often the desktop wallpaper changes and which folders it uses to find the wallpaper. Using this tool you can customise other features such as toggling the clock on and off as well as changing the style of the clock and you can remove the daily quote if you so wish. For those of you new to Linux, connecting to the internet is very straight forward. Click on the network icon in the system tray, choose your network and enter the security key. 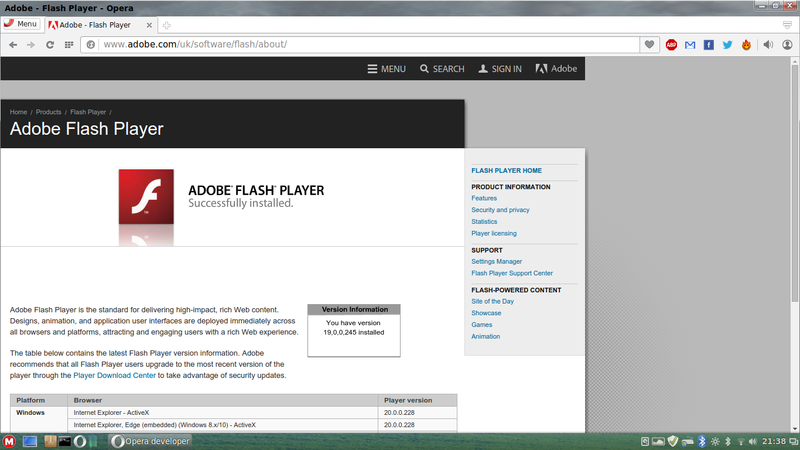 Flash works out of the box, as does Silverlight. Makulu is basically designed to be useful straight away and when I get to the applications section you will see just how far it goes. The default audio player in Makulu is the excellent Rhythmbox. 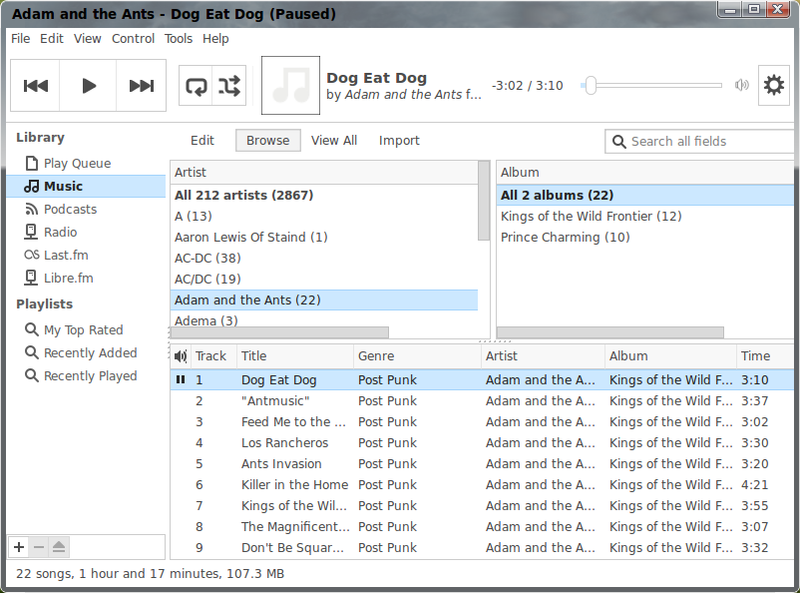 There are two Linux audio players that I 100% recommend. The first is Clementine and the second is Rhythmbox. Click here for a guide highlighting all of the features of Rhythmbox. It is worth pointing out that MP3 audio works without having to install extra multimedia codecs. 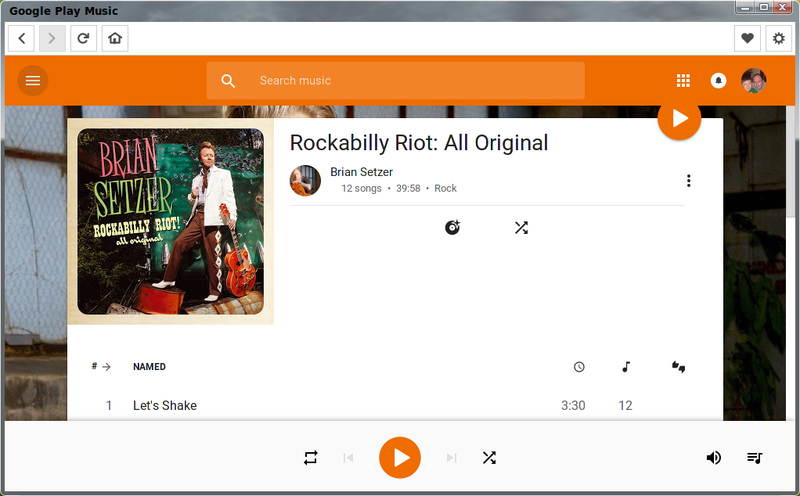 Also included within Makulu Linux is the Google Music Player. Simply sign in to your Google Music account and you can play all of the songs in your library. You can also download the songs if you so wish. The default video player in Makulu Linux is BOMI. This is the 2nd distribution in a row that I have reviewed which has included BOMI as the default video player. 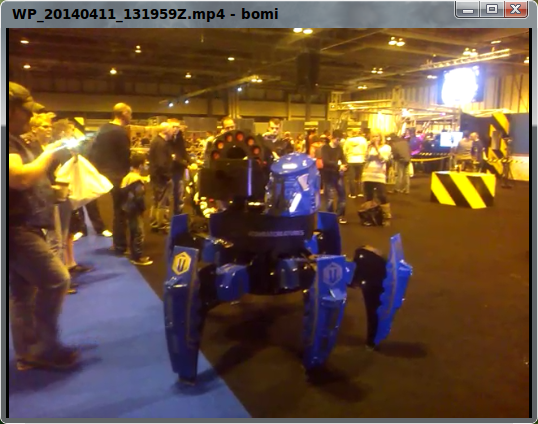 I’m not convinced it is better than VLC but it works. Up to this point you might be thinking that Makulu is basically Linux Mint with a few theme changes. The thing that sets Makulu apart is definitely in the choice of applications. The software picks are definitely unique and they rank anywhere from incredibly useful to a little bit strange, even stretching to controversial. Let’s start with the web browser. For me there are only 2 web browsers worth using within Linux and they are Chrome and Firefox. I will generally settle for Iceweasel and Chromium. (See 4 of the best web browsers for Linux). Some distributions have Midori and I have seen a few Qupzillas. Never have I seen a distribution use Opera as the default browser. Yes that is right, Makulu has Opera as the default browser. To be fair it isn’t that bad although my first decision was to switch it out for Chrome. Moving on to the email client. Claws. Ouch. Why? I wrote another article at About.com listing the best and worst Linux email clients and I have put Claws as my least favourite email client. Makulu isn’t set up to be a lightweight distribution so why default to a lightweight mail client which struggles to connect to the most used webmail provider. Personally I think the developers should stick to the tried and trusted, either Evolution or Thunderbird. (or IceDove). It isn’t all bad though. Makulu Linux comes with Steam, PlayOnLinux, WINE, Skype, Google Music Player and Rhythmbox installed by default. Kingsoft Office is the default office suite and to be honest it isn’t too bad. It boasts good compatibility with Microsoft Office. I tried loading in my CV (Resume) and it looked ok but because my CV was written using the Calligra font the spacing was a little bit out. 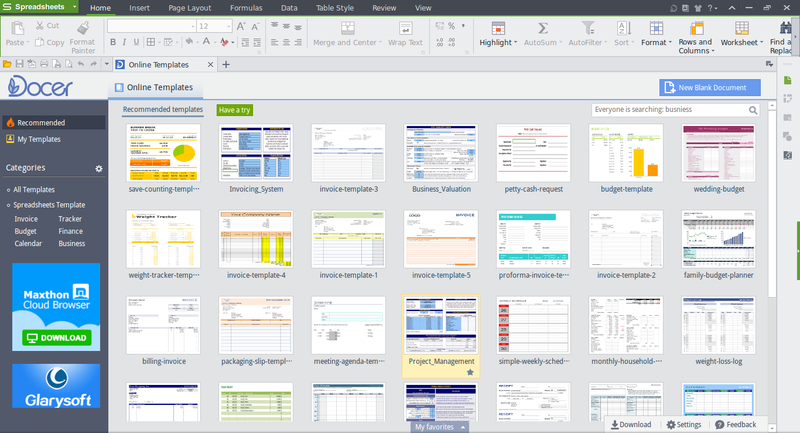 There are hundred of templates available within Kingsoft Office which means you can create newsletters, budget planners, invitations and all the stuff you would normally save for the home office. The one thing the spreadsheet package lacks is the tool every amateur programmer needs and that is the ability to write macros. All in all Kingsoft Office is fairly decent. Another tool I really like that is installed by default is the Radio tray application. Basically this tool lets you select from a number of online radio stations separated into genres such as rock music, jazz and pop. Rather controversially, Makulu has Popcorn time installed by default. Popcorn time is illegal in most western countries because it basically lets you stream illegal video content such as movies and tv shows. I find it quite intriguing as well that Makulu has the Mega sync tool included which enables you to synchronise your files between your computer and the Mega file storage service. Mega is the brainchild of the legend that is Kim Dotcom who has spent many years facing extradition to the USA and who potentially could spend years in prison for the previous incarnation of the Mega Upload service. I am surprised that this tool is installed and not something more common like Dropbox. 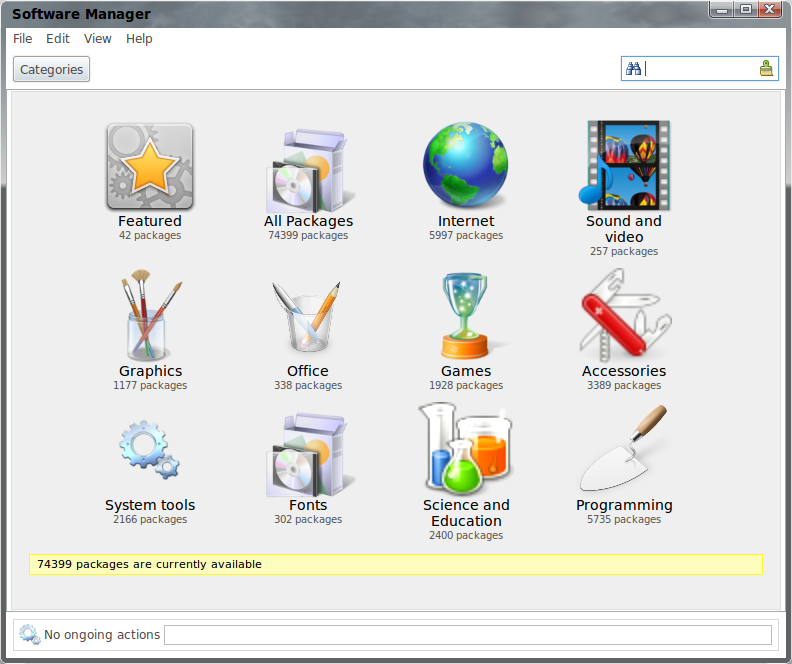 Makulu provides a software manager for installing extra software. You can either search using the box provided or browse by category. I had no real issues with Makulu. I was able to connect to my wireless printer and I was able to connect to the Western Digital MyCloud device (amazing). I did have the same language issue that I experienced with Chakra Linux. Despite choosing English (UK) during the installation, the default keyboard layout set itself to US English. It is easier enough to fix using the Keyboard settings tool. No errors have appeared in the two weeks that I have been using Makulu. Makulu made my list of the 7 best alternative Linux distributions of 2014 and it will definitely make the list of best alternative distributions for 2015. I really like Makulu and despite some bizarre software picks it really does everything the average user wants to do without having to install extra software or having to mess around installing codecs or running command line scripts. The installer might be a little baffling around the partitioning section and so it is definitely worth watching the video. To answer the question posed by the Linux Help Guy. Who is Makulu for? I would say it is for the Everyday Linux User. If you are looking for an alternative to the usual candidates of Ubuntu, Mint, Zorin, Debian, openSUSE, Fedora and PCLinuxOS then why not give it a go. At the very least it is worth trying it out in a virtual machine. Popcorntime is strange because it is not working anymore. They are working on a restart at http://butterproject.org/. Stremio is another option if you don't want to pay for your movies and series. And because silverlight is already installed, you could consider Netflix. 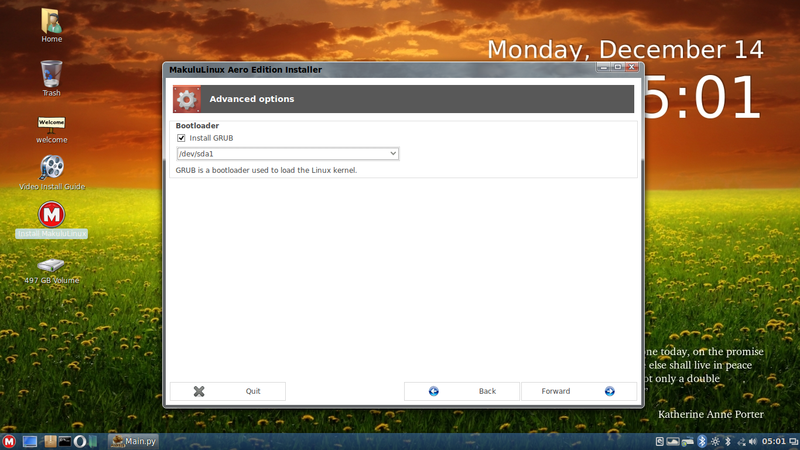 Clement of Linuxmint advices to install silverlight via wine and not pipelight. So only when you want it, Silverlight is there (in wine) and not every time you start a browser. I think, he has a good point. Strange distro. 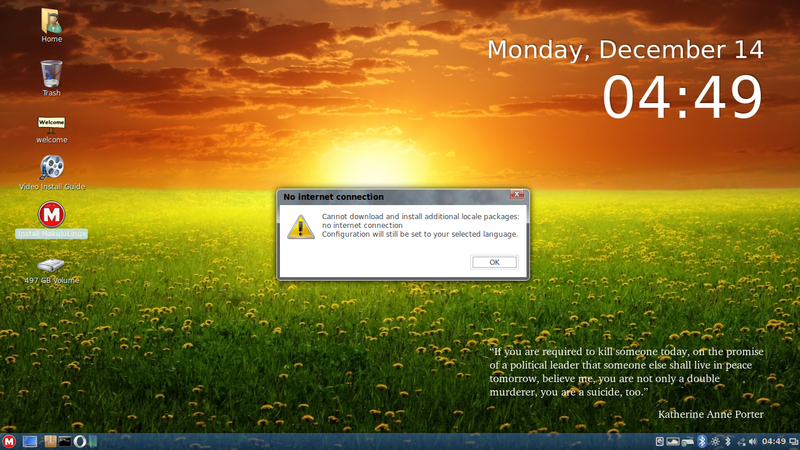 Peculiar choice of apps, and then it would not even install, as installer hung. I have like Makulu for quite some time and recently tried this version of it. Overall I liked it but I do agree that Chromium or Firefox are a better option for the web browser. Makulu now has a newer release as of 2016 called Lindoz which has more standardized Linux apps and improved desktop.